Even though Dredd fans are still waiting for a live-action sequel to get the greenlight, it’s rather amazing that the box office failure has managed to inspire not only a crazyballs bootleg animated series, but also official comic book sequels. Enter Rebellion’s Dredd: Uprise #1, the first in a two-issue arc continuing the cinematic storyline of Dredd. It’s mildly disappointing that this intriguing storyline will already be completed by this time next month, but it will hopefully assist convince producers and studios that we need more big-screen Dredd in our lives. In Dredd: Uprising, some citizens of Mega-City One — particularly those in the slummy part called “The Spit” — are protesting the massive mega-block construction called Oemling being built right in the middle of everything. When one Judge unknowingly steals the car of a community hero, the level of unrest grows monumentally. Behind it all is a faceless Anonymous-type threat that calls itself “Uprise,” with a more progressive and bullet-ready approach to protesting. But who is Uprise? The legions of fans of Dredd, and we know there are a great many of you out there, have been clamoring for a sequel, and while we’re probably not going to get a proper follow up, especially not anytime soon, we’ve got something new to keep you occupied for the time being. 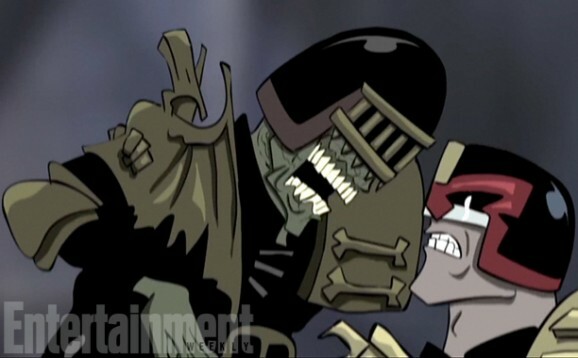 Last week there was a flurry of activity around Adi Shankar’s unofficial, loosely connected web series Dredd: Superfiend, and today all six episodes appeared online. If you paid attention to any of what popped up last week, you know it’s not exactly what you expected, or hoped for, but it’s batshit crazy and definitely worth checking out. Shankar, a producer on the Karl Urban starring Dredd, which tanked hard at the box office but found a rich second live in the home video market, also served up this intro which you can watch above. He lays out the reasons behind this endeavor, stating that this is a passion project, intended as a thank you to all the rabid fans. Again, he makes sure to reiterate that this “bootleg universe” is not official, that neither 2000 AD nor Relativity even knew this was going on, and this is not intended a pitch for anything beyond these six short videos. 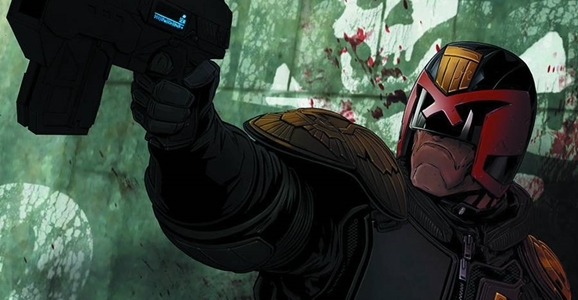 While we’re not likely to get a sequel to Pete Travis’ 2012 comic book adaptation Dredd, at least not anytime soon (no matter what star Karl Urban says), we’ve spent a lot of time recently talking about a follow up of sorts. Dredd: Superfiend is an unofficial, unsanctioned adaptation of the 2000 AD comics title, and so far this week we’ve seen the first photos and a teaser trailer. Now we’ve got the first full-length trailer, and like everything we’ve seen thus far, it’s not exactly what we expected. The brainchild of Dredd producer Adi Shankar, who, as he points out in his introduction, has no legal or practical claim on this material, this is definitely more in line with the comics than the movie. While the film is stone-dead serious, the comics are very satirical in nature, and that comes across in this longer look at Superfiend. While I was initially concerned about the look of the animation, the twisted, Heavy Metal-ish style actually feels like a good fit for this particular take on the source material. Yesterday we showed off a first look at the upcoming unofficial Dredd sequel Dredd: Superfiend, and the general consensus is that it wasn’t exactly what we expected when we first heard about this project. Not that it won’t be cool, but we just didn’t necessarily anticipate seeing a cartoon. And hot on the heels of that reveal, we now have your first look at these images will look like when they actually start moving around your computer screen. The brainchild of Dredd producer Adi Shankar, this is not necessarily meant as a follow up, per say, but as something for the fans to have fun with and enjoy while we wait, most likely in vain, for Dredd 2. Despite star Karl Urban’s unending optimism, it’s doubtful we’re ever going to get a proper sequel. Even though Pete Travis’ film has legions of fans that discovered the grim, gritty comic book adaptation on home video, it was a complete and utter failure when it briefly stopped in theaters in September 2012. As much as fans are frothing at the mouth, screaming for an addition to Pete Travis’ adaptation of 2000 AD’s Judge Dredd comics, Dredd, we’re just not likely going to get any more, at least not in a traditional sense. That’s just the unfortunate reality of the situation (there is this sweet musical though). The film was an absolute bust at the box office, and though it broke records when it hit the home video market and found an entirely new, rabidly devoted fan base in the process, studios aren’t exactly lining up to produce another installment. But we’ve got comic book follow-ups, and producer Adi Shankar announced earlier this month that was working on an online miniseries, which we now have our first look at, and it may not be what you anticipated.